A select group of six set off today for the medium plus fast group on a still but cool morning, perfect riding conditions, especially considering its still winter. 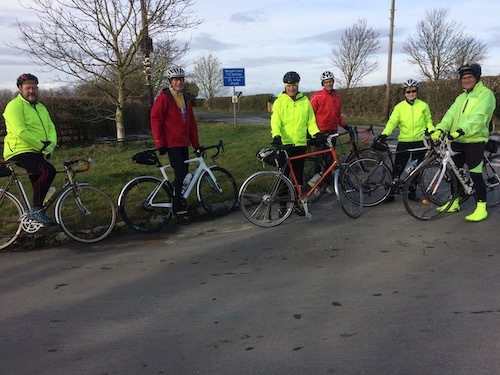 We encountered a few groups out cycling, Knaresborough being one, as we sped into Aldwark Bridge, where it was decided to add a few miles on and head to Benningborough. The temptation of the cafe was avoided, and we ended up back on official route at Myton On Swale, where we came across some other medium plus groups who were waiting for others to regroup. Some very quiet country lanes around a very nice part of the world with one or two rather nice properties! 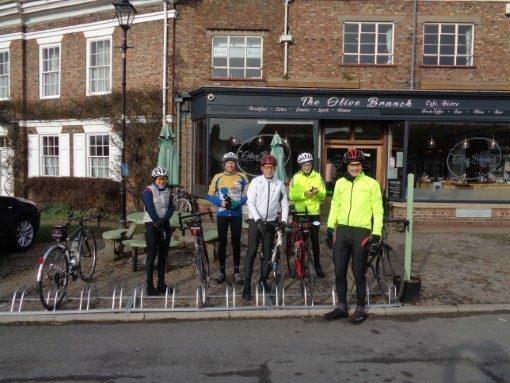 The pace picked up a tad on the route in to the cafe at Boroughbridge, where we saw other members of a Wheel Easy group waiting by the road and Tony speeding off in the opposite direction……..at least we think it was you Tony, hope you had a good ride. Thankfully we arrived first at Plenty in Boroughbridge, where discussions about potential away day trips and Sportives ensued. Fortunately we were served in good time because as we left a number of other cyclists came in to this ever popular cafe. Martin, our leader left us here for his short journey home, which left David, Mark C, Grant, Darcy and myself to tackle the only hill of the day, Knaresborough. Storm Erik had gone leaving a calm morning as riders met at Hornbeam, the brisk Medium Plus group set off leaving 11 riders to make their way down Forest Moor Road regrouping at low bridge. 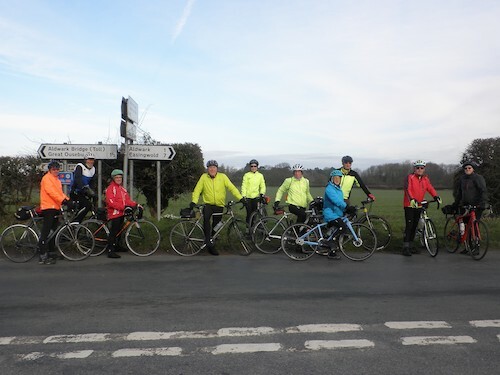 There was a few complaints of cold hands and feet which soon stopped as we cycled up the Farnham hill warming riders up! Then a steady cycle out to Great Ouseburn to regroup and get a photo, however a few riders carried on at a faster pace spreading the group out. Liz F had to be back home early and was going to leave us at Great Ouseburn, however she decided to carry on. I did a quick sprint to catch up with riders out front, to do a regroup just over the Aldwark Bridge. 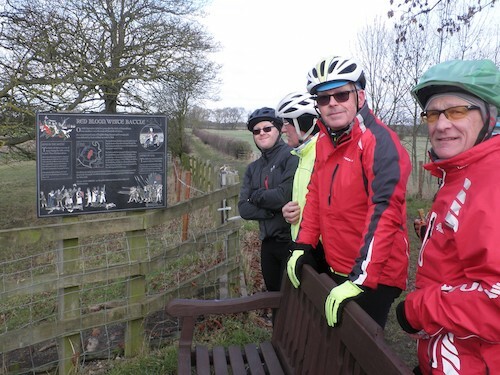 Then on to Myton and deciding whether to stop at the plaque of the Battle of Myton, two riders said they had never seen it or knew of the battle, so we went to enlighten them of the local history. Then it was a pleasant ride on towards Boroughbridge as the sun came out, stopping at ‘Plenty’ for coffee. Liz was now concerned of the time so did not stop and carried on, hopefully she got her dinner before the Rugby started! After the stop it was the usual way back, Staveley, Farnham and up Knaresborough Hill where we all split up to go different ways home. 43 miles. Chris R.